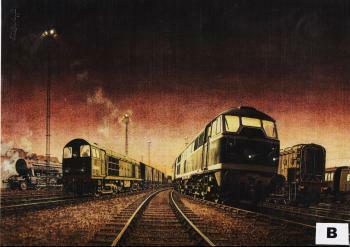 Example of the first two diesel types to be built under the pilot scheme greet the cold raw light of a winter's dawn at Ripple Lane Marshalling Yard near Barking. The great £1.2 million modernisation plan for British Railways announced on 24 January 1955 proposed many far-reaching changes that would finally shake the system out of its post-war doldrums. The money was to go to rebuilding stations, improving track, introducing new colour light signalling, fitting freight trains with continuous brakes for faster running and building more new carriages. But for many people the most significant changes were those proposed for BR's motive power. The plan called for widespread electrification of main line and suburban routes, with diesels taking over from steam elsewhere. After the completion of existing orders no new steam locomotives were to be built. The only main line diesels BR had at that time were the prototype designs inherited from the LMSR and SR. No large scale facilities to build diesels existed in BR's own workshops and there were relatively few private builders with sufficient experience to handle big orders for diesels. A pilot scheme was decided on. One hundred and seventy-four diesels of various designs in three power ranges between 600 and 2000hp were ordered from different manufacturers. It was intended that each type would be put through extensive tests and the best designs identified before large scale orders were placed. First locomotive to be delivered under the pilot scheme was No. D8000 in July 1957. Built by English Electric it was a 1000hp diesel-electric for freight work. The following October No. D5500 a 1250hp diesel-electric for mixed traffic duties appeared from the works of Brush at Loughborough. Both types proved excellent and were built in large numbers, many of them still in service today, although the two original locomotives have long since retired to the sanctuary of the National Railway Museum. Mounting financial problems for BR led to the abandonment of the slow but sure pilot scheme at the end of the 1950s. Urged on by a government anxious to see quicker results from modernisation, diesels were ordered off the drawing board in large numbers without proper testing. In all too many cases they were expensive failures. Flanking the glamorous test pilots are two of BR's most unattractive workhorses: a pug-ugly 'Austerity' 2-8-0 freight locomotive and one of the ubiquitous 350hp diesel shunters which once numbered over 1000 and could be seen in virtually every yard and at every large station.